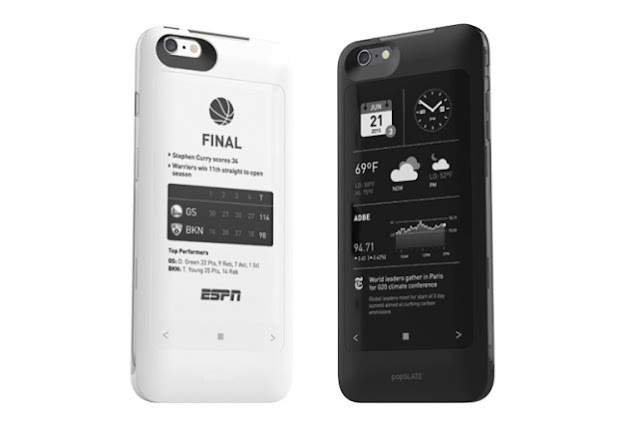 The creators of the original popSLATE are back with a new e-Ink case for the iPhone 6/6S, and it's better than ever. While we still have the same basic concept; a case for the iPhone (available for iPhone 6 / 6S and Plus versions) that adds a secondary e-ink screen on the back, which we can use to display a wide range of information that is always visible on screen without drastically affecting the battery - or, basically, turning an iPhone into a Yotaphone - this new popSLATE 2 has a larger screen (4.3 and 4.7" instead of 4") is thinner (only 4mm), and has three touch buttons for direct interaction. It also uses lightning connectors, ditching the need for a separate micro USB cable. On the software side, we can now show a wider range of information on screen; widgets, weather and clock, news, lists, and also ebooks. The transfer time of information from the iPhone to the screen was also greatly improved, now being virtually instantaneous (0.1s) instead of the 2s it took on the previous version. Everyone who's Interested can get a popSLATE 2 for $ 69 (plus delivery) with delivery promised for July. One of the biggest risks, in addition to the implicit risks of crowdfunding campaigns, is that the newer iPhone 7 will be launched soon after that, and with a new design expected, you won't be able to use these popSLATE 2 with it.